Iespēja pieteikties FEJS jauno žurnālistu kongresam "Eiropas krīze: žurnālistu misija"
FEJS International un FEJS Austrija aicina piedalīties gadskārtējā jauno žurnālistu kongresā. Šī gada tēma ir "Eiropas krīze: žurnālistu misija". Tas notiks Vīnē no 19. aprīļa līdz 24. aprīlim. Pieteikšanās līdz 13. februārim. Pieteikuma anketu iespējams aizpildīt šeit. Tear gas on the streets of Athens, protest camps in Spain and closed borders in Denmark – it has been a tough year for the vision of a peacefully united Europe. But how could that all happen? Has this vision expired? The European project is stuck in a crisis. Several countries find themselves in a severe economic downfall whereas others openly consider tax cuttings. The common currency is more and more contested. From a lot of citizens’ point of view Brussels increasingly becomes the problem, not the solution. How can young people from Portugal, Finland or Greece understand what’s going on? Do they have to understand each other? And if so, what contribution can journalism make to all this? A young generation of journalism students will have to find answers to those questions. In order to reach this goal different lectures, workshops and panel discussions with scientists, correspondents and media enterprises will be held. How can be made use of the Internet more purposefully? What can universities contribute? From which mistakes in the past can be learned? In the end there is a goal neglected for too long: Finding ways to a European public sphere. The FEJS International v.z.w and FEJS Austria are proud to announce the opening of the application procedure for the Annual Congress 2012 in Vienna, Austria. The AC will take place from the 19th to the 24th of April 2012. The topic is EUROPEAN CRISIS: A MISSION FOR JOURNALISTS. Through workshops and lectures pan-european media projects of the past, present and future will be analyzed. The problems to be solved and the requirements needed to be achieved in order to establish a European Public Sphere will be discussed and investigated. The application procedure deadline is the 13th of February 2012. 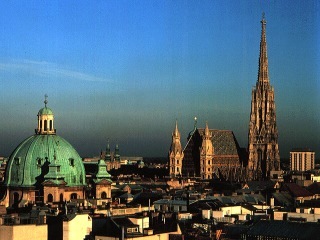 To visit the AC 2012 Vienna, Austria website follow this link.